Canada thistle is a perennial plant that grows from a vigorous, spreading root system. It grows up to 4 feet in height with multiple branches growing from a single, heavily ridged stem. The spiny leaves are deeply lobed, oblong, and up to 6 inches in length. Stem leaves are clasping and alternate. Each stem produces several flowerheads armed with small spines. The flowers are small and lavender to purple in color; male and female flowers grow on separate plants (dioecious). The smooth, light-brown seeds bear a white plume of hairs. Grazing Objective: Begin grazing when rosettes are green and begin to sprout. Remove animals when grazing shifts to desirable species and then regraze new sprouts. Growth Stage for Treatment: Graze during the seedling through late vegetative stage, with regular removal of top growth throughout the season. Graze often enough to prevent flowering. Grazing treatment will need to be repeated at least three years. Goats will graze older plants. 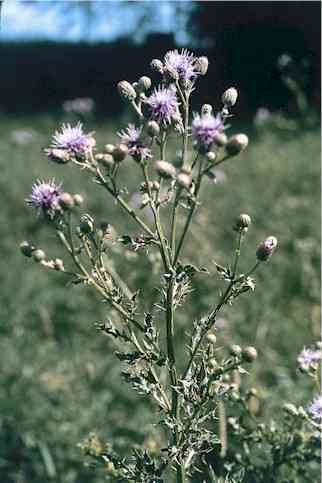 Potential Effectiveness: Goats, sheep, and cattle can damage Canada thistle with repeated grazing to prevent flowering. Goats are the preferred grazing animal, followed by sheep and cattle. Sheep and cattle prefer to graze this plant when it is young before spines develop. Grazing is most effective when repeated during the season and for multiple seasons to prevent seed production and to deplete root reserves. Plants are smaller and weaker in successive years after repeated grazing. Most information suggests best results are achieved when grazing is combined with herbicide treatments. Integrated Pest Management Practitioners Association (IPMPA). 2000. Canada thistle. IVM Technical Bulletin. Available at: http://www.efn.org/~ipmpa/Noxcthis.html. Accessed 03 September 2006. De Bruijn, S.L. 2006. Biological control of Canada thistle in temperate pastures using high density rotational cattle grazing. Biological Control 36:305-315. Donald, W.W. 1990. Management and control of Canada thistle (Cirsium arvense). Review of Weed Science 5:193-250. Morishita, D.W. 1999. Canada thistle. In: Sheley, R.L. and J.K. Petroff [EDS]. Biology and management of noxious rangeland weeds. Corvallis, OR: Oregon State University Press. p 162-174.